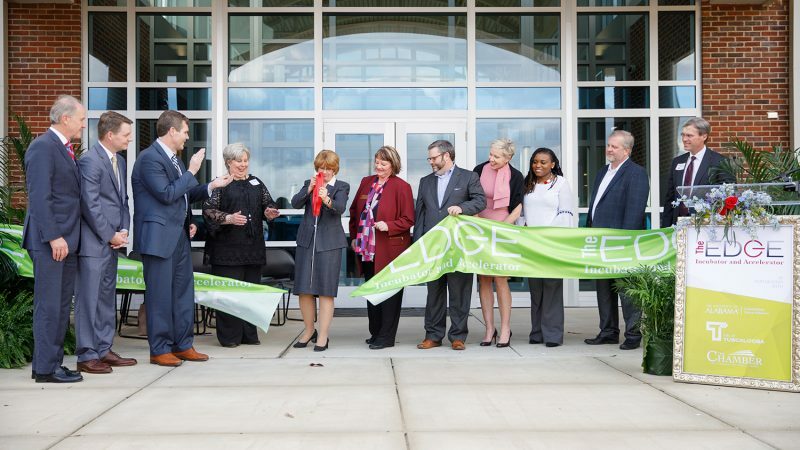 TUSCALOOSA, Ala. — The EDGE, a 26,000 square-foot business incubator and innovation space for entrepreneurs, officially opened its doors in a ribbon-cutting ceremony Wednesday, February 6. Located in the heart of Tuscaloosa, Alabama at 2627 10th Avenue, The EDGE is the result of a partnership between The University of Alabama, via the Culverhouse College of Business’ Alabama Entrepreneurship Institute, the City of Tuscaloosa and the Chamber of Commerce of West Alabama. The EDGE is both a workspace and a catalyst for business networking that will host regular workshops, forums and informal gatherings. The $11.7 million facility includes 20 offices, 100 workstations and several conference rooms, all offered to entrepreneurs, people seeking to build their businesses and individuals who need working and networking space. Besides providing a place to work and meet for the Tuscaloosa entrepreneur and freelancer community and entrepreneurial-minded students, The EDGE also will host special events that further drive area business and job growth including pitch events and hackathons. 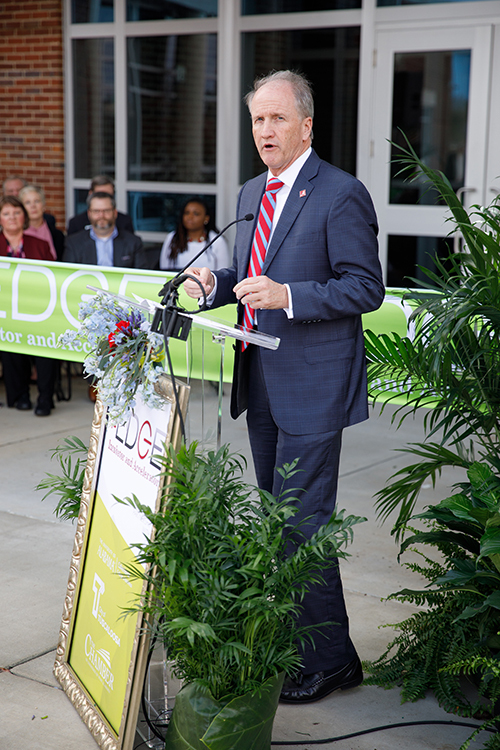 Watch a video recap of The EDGE ribbon-cutting ceremony above. 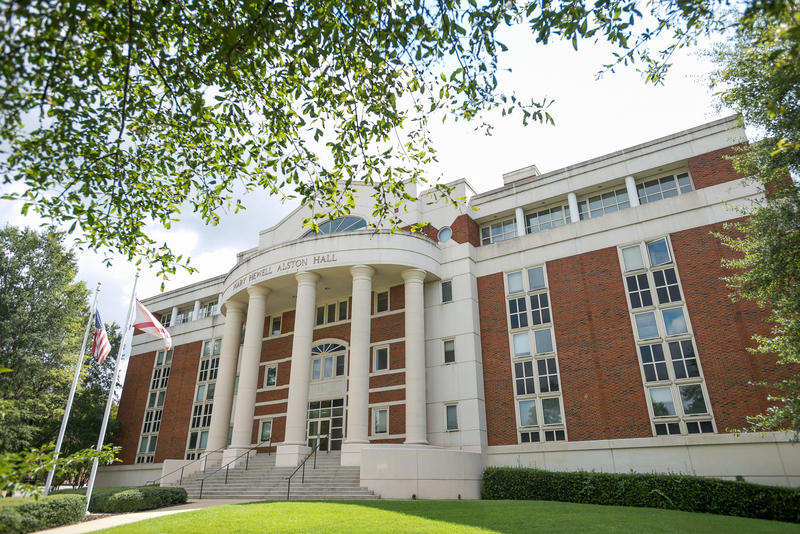 The EDGE is the culmination of years of hard work that all started with conversations about how to help Tuscaloosa recover and rebuild after a devastating tornado struck on April 27, 2011. The location of the facility is in an enterprise area outlined by the path of the storm, which extended through most of the city and ultimately stretched to Birmingham. Dr. Stuart R. Bell, president of The University of Alabama, was next to speak. He focused on the University’s role in supporting entrepreneurial initiatives and championing economic development not only in the west Alabama region, but throughout the entire state and nation. Dr. Bell also acknowledged a recent generous gift of $1 million from Medical Properties Trust, Inc., led by UA alumnus Edward K. Aldag Jr., to support entrepreneurship initiatives at the Capstone. UA President Dr. Stuart R. Bell explaining what The EDGE represents in terms of collaboration between Tuscaloosa and the campus community. As a result, the first iteration of The EDGE, located in a space loaned by Region Bank, opened its doors just a few months later. Page then described the winding path to the current space, outlining how all the partners came together to build a debt-free facility partially financed using disaster relief funds. After the ribbon was cut by Culverhouse College of Dean Kay M. Palan, The EDGE hosted a reception and open house that included product and service showcases from current tenants. Contact Dr. Theresa M. Welbourne, Executive Director of the Alabama Entrepreneurship Institute and The EDGE, at twelbourne@culverhouse.ua.edu for more information. To learn more about The EDGE and how to get involved, visit the-edge.ua.edu.